The Super Bowl is as much about food as it is about football. Chips, beer, beef and cheese. I think that pretty much covers it all, right? You can cut out thousands of calories just by being a bit more picky about what you score for Sunday’s game. Here’s one recipe that sounds pretty easy and tasty! Who doesn’t love guac? In a blender or food processor, puree the green beans, avocado, garlic and lemon juice until very smooth. Stir in the peppers and cilantro. Pair this with some tasty All-Bran crackers, warmed pitas or blue corn chips. I love these crackers! You can eat 18 for 130 calories, 6 grams of fat and 5 grams of fiber! 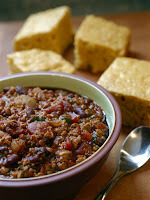 Or make a vegetarian chili and top it off with some fat free cheese. And for those of you ready to take a leap of faith, try these Tofu Tenders. What’s your favorite Super Bowl snack? This entry was posted by kate, on Thursday, February 4, 2010. You can leave your response .